2019 Hill City Quilt Show & Sale – Located in the Hill City Middle School gyms, 488 E Main St, Hill City, SD 57745. Join us September 7 & 8 from 9 am – 4 pm daily for this two-day celebration of fabric arts. The show features a vendor mall, demonstrations, prizes, special events, and over 200 beautiful quilts. Special events will include a Featured Artist, a Bed-Turning & Supper on Saturday, and a Pillowcase Roundup to help area kids in need. More details TBA. Admission is $5 at the door for adults. Kids ages 18 & under get in free. For more information visit http://www.hillcityarts.org/hill-city-quilt-show . 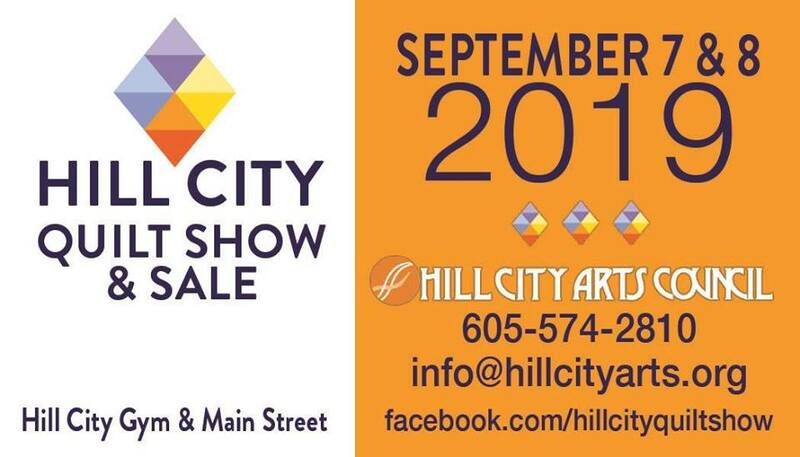 Contact the Hill City Arts Council at 605-574-2810 or info@hillcityarts.org . The 2019 Hill City Quilt Show is brought to you through a partnership with the Hill City Quilt Show Committee, Heart of the Hills Quilters Guild, and Hill City Arts Council.